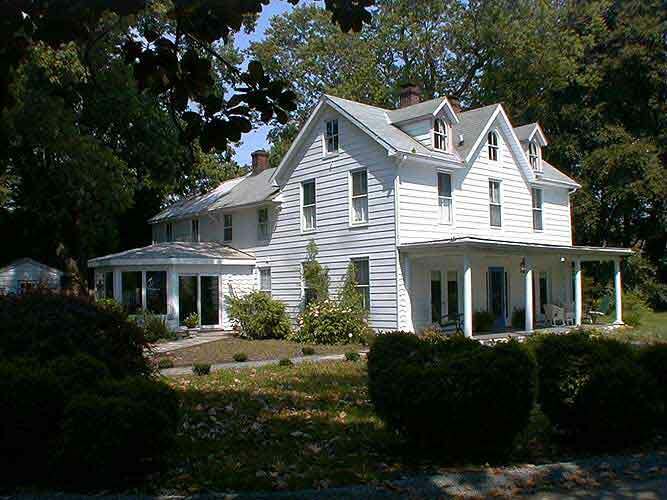 Your hosts Liese and Jim Gillin have operated their other B & B, the The Bay Breeze Inn in Rock Hall, since 1990. Liese is a nurse anesthetist and Jim is a retired university academic director. Both are avid kayakers and sailors. They opened Chester River Kayak Adventures in 1998 to share their paddling passion with others and have, in 2003, added a sailing package to Spring Cove Manor. Like many others in Rock Hall, they are imports from Pennsylvania who fell in love with the rural beauty of Kent County with its' unhurried pace, and decided to make it their home. They recognize the rich resources of the area and enthusiastically share "insider" information with their guests. Speaking of why folks come to Rock Hall, Jim says, "Sometimes it is necessary to step off the treadmill and escape to a quieter, simpler time where you can refresh your spirit." Spring Cove Manor sits on 8 wooded acres well planted with mature pines and hardwoods. Through the stone walls at the entrance you'll travel a 400 foot drive lined with old cedars. It is a secluded and serene spot that fronts on Spring Cove, a tributary of the Chesapeake Bay, yet it is less than a mile from the main street of Rock Hall. From the inn, you can stroll down to the public landing at the edge of property to watch waterman bringing in their catch or simply observe graceful sailboats at a nearby marina. Bring your camera. There is ample opportunity to photograph native waterfowl and, in the spring and fall, to catch magnificent sunsets. Don't be surprised to see herds of deer and an occasional red fox as you watch from the large windows of the conservatory and living room. Spring Cove Manor invites you, in the words of Simon and Garfunkel to "Stroll around the grounds until you feel at home." 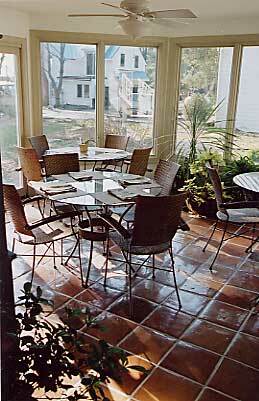 If you're looking for that special place for an escape, you've found it at Spring Cove Manor. The original house was built in 1890 by Dr. Magniss, a Baltimore physician, as his summer retreat. It evolved over time to a permanent residence occupied by his daughter, Eleanor Lynn, who lived there until 2001. Miss Eleanor, a history buff and preservationist, has been recognized by the Kent County Historical Society for her many contributions and has dedicated a collection to the Enoch Pratt Library in Baltimore. In converting the home to a bed and breakfast, Liese and Jim Gillin have tried to preserve the feeling of the original house and have retained many of its original furnishings. You'll note a distinct oriental influence in the house the result of travels by the Magniss family. 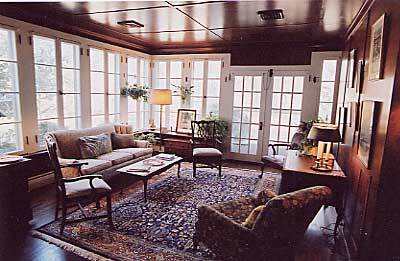 This is the web site of Spring Cove Manor. Our postal address is 21060 Spring Cove Road, Rock Hall, Maryland 21661. We collect no permanent information on consumers who browse our web site. We do collect the e-mail addresses of those who communicate with us via e-mail. The information we collect via e-mail is used for our internal customer address list only. No information about you is ever shared with any other person or organization.